This weekend’s Kansas birding excitement came from the southwest part of the state, when a pair of visiting birders found a pair of birds never before officially documented in the state. The birds were bronzed cowbirds, mostly native to Mexico and Central America. They were discovered at Arkalon Park, near Liberal, on Saturday, (June 2) by Ethan Kistler, an Ohio native now leading birding tours in South Africa, and his friend Billi Krochuk, a South African birder/biologist now working in Colorado. Bronzed cowbirds are about 8-inches long with wingspans of around 13 inches. That’s about the same size as brown-headed cowbirds, a species common from southern Canada into Central America, and from the coast to coast in the U.S.
Several birders saw the male bronzed cowbird, with its fiery red eyes, displaying for a female of the same species. Most first-of-state findings involve a single bird, not a possibly mating pair. 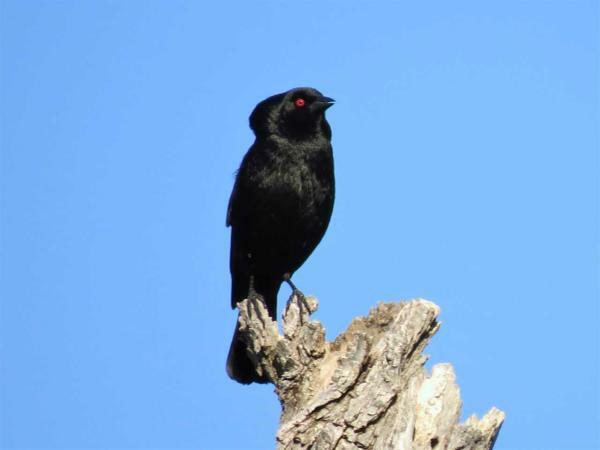 The bronzed cowbirds could be the first new birds found in Kansas in a year or more. According to the Cornell Laboratory of Ornithology website, southern Texas is considered the northern range for the species. 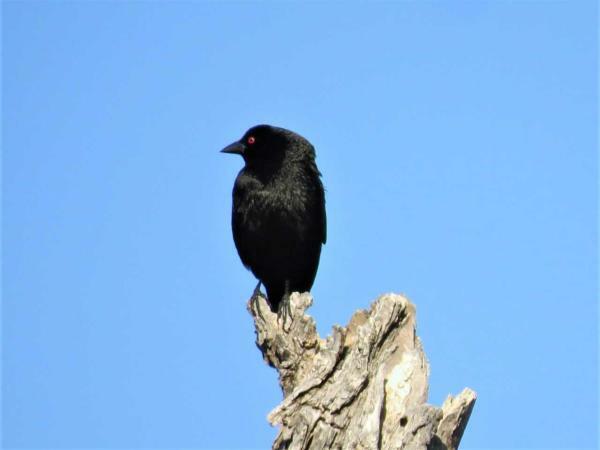 On Kistler’s initial Facebook post, some birders said bronzed cowbirds had recently been documented in the Texas panhandle and near the Kansas border in Oklahoma. On Sunday some birders found a pair of bronzed cowbirds about a mile from where Kistler, Krochuck and several Kansans had seen birds earlier. Though doubtful, it’s possible there are two pairs of bronzed cowbirds in that area. Arkalon Park is an oasis of trees and water about 10 miles northeast of Liberal, with ponds for fishing, nature trails and campgrounds. The park charges fees for camping and fishing, in addition to any state requirements.